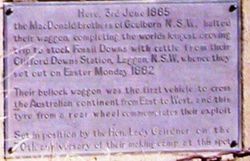 A monument commemorates the MacDonald brothers who made the first vehicle crossing of Australia from east to west in 1882. 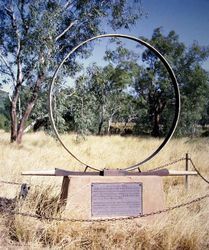 The lease to Fossil Downs had been issued in 1883 to Dan MacDonald for his family who were living in Cliffords Creek, New South Wales at the time. He applied for an area of 259 square kilometres (100 square miles) at the junction of the Margaret and Fitzroy Rivers. The MacDonalds, together with the McKenzie family from the Junction near Teuna who were close friends and related through marriage to the MacDonalds, formed a partnership to stock and equip the station in Western Australia. The McKenzies paid the £25 for the first year's rent and the families departed their New South Wales properties in March 1883. Donald MacDonald died early on the journey after being thrown from a horse, leaving two of his sons, Charles and William, to drive the stock 5,600 kilometres (3,480 mi) to the new property. They left with 700 head of cattle and 60 horses, encountering drought conditions as they trekked through Queensland. Arriving at the property in June 1885 with 327 cattle and 13 horses the brothers reunited with Dan and set up camp. 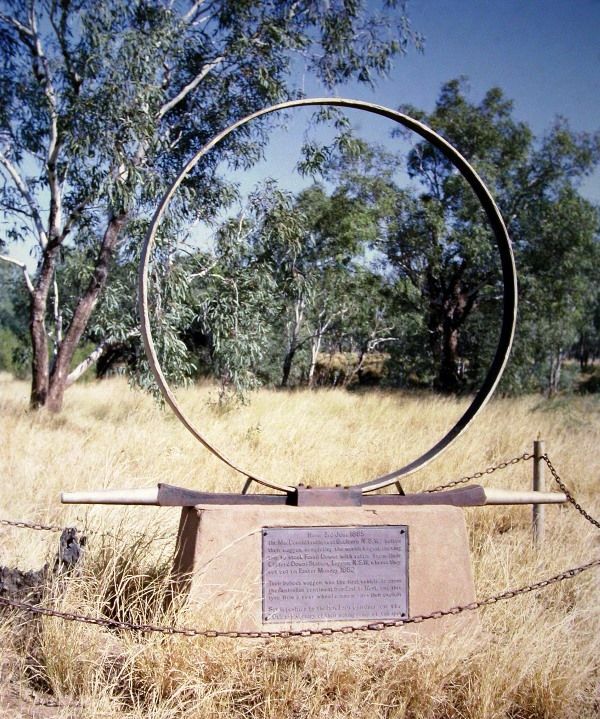 This is thought to be the longest overland cattle drove in Australia's history. set out on Easter Monday 1882.
tyre from a rear wheel commemorates their exploit. 70th anniversary of their making camp at this spot.